For the latest medal tally, China still leads London 2012 Olympics for achieving 12 medals so far, 6 gold, 4 silver and 2 bronze. Meanwhile, United States overtake Italy with 11 medals in total ( 3/ 5/ 3). China and US are two countries which are predicted to lead over-all medal supremacy. From the Wall Street Journal post, it said that China became the first country since 1992 to win more Olympic gold medals than America. The Wall Street Journal's medal projections for London suggest the Star-Spangled Banner will once again play more often than any other anthem. China's victory in the gold-medal race in 2008 was supposed to herald the arrival of the newest Olympic superpower, a vast country with 1.3 billion people and a proven government-sponsored training program and even at the U.S. Olympic Committee headquarters in Colorado Springs, there was a growing sense that China would win the most gold and overall medals in 2012, Wall Street Journal said. The Wall Street Journal's projections show Team U.S.A.'s 530 athletes should leave London with 40 gold medals and 108 overall, topping the Chinese, who are projected to collect 38 gold medals and 92 overall. The Journal's forecasting system takes into account basic information such as interviews with experts and the performances of athletes in recent national and international competitions. But rather than simply anointing first-, second- and third-place finishers in each event and calling it a day, the model assigns probabilities to the top medal contenders, then uses those probabilities to project the most likely outcomes. 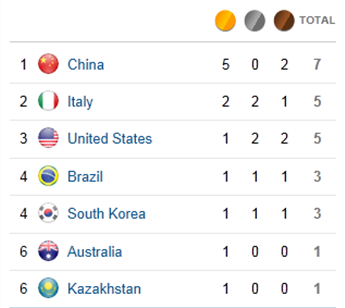 In the latest medal tally standing, China got the lead with 7 medals ( 5 golds and 2 bronzes). China scores best for the shooting, swimming and weightlifting events. Medal tally standing is followed by Italy with 2/2/1 and United States 1/2/2 (gold, siver and bronze) respectively. Wenjun Guo and Siling Yi both won gold in shooting. Shiwen Ye and Yang Sun bested opponents and also grabbed gold in swimming. Mingjuan Wang won gold in weightlifting. Xuanxu Li got bronze in swimming while Dan Yu still managed to got bronze in shooting. 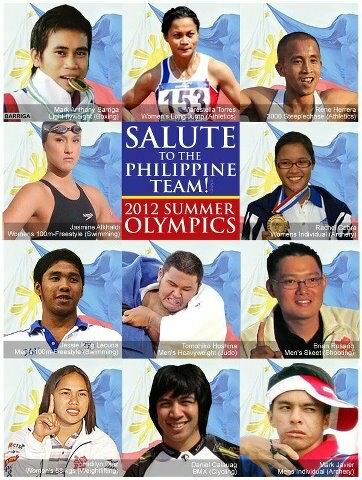 Philippines have no medal yet but we hope to get some golds for the succedding events. Opening salvo for the Philippines fight was leaded by Rachel Ann Cabral and Mark Javier in the archery event. Cabral completed ranking round of the women’s individual competition on Friday, placing 48th among 64 archers in the field. 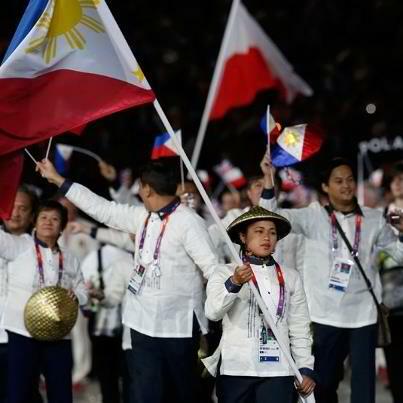 Click HERE for the Schedule of Events for 11 Filipino athletes. I got the feeling of excitement about blogging for London 2012 olympics specially for the latest updates in the Opening Ceremony happened around early morning, July 28, 2012 Philippine time. Since I am not able to watch it live over the television and I only have a laptop and internet connection, I thought I can get videos and live updates easily for my readers to be updated. But, the whole day of checking of working videos to share became a challenge. I had started posting about the history of London 2012 Olympics, how the bid goes to London and the preparation IOC have done with all the enthusiasm of sharing information but unfortunately the needed videos that should be viral now has been blocked by IOC (International Olympics Committee). Though this morning, I used to watch some videos like James Bond having escorted the Queen of England but that was in a few minutes only and suddenly been blocked by IOC with this message "This video contains contents from the International Olympics Committee, who has blocked it on copyright grounds". For I need to include videos for my blog post, I found one Youtube upload (London Olympics 2012 Opening Ceremony At The Olympic Stadium 23 from OlympicsGames4me ) that I think has no copyright but still grabbed it and luckily shared on my post. I've also checked it first if it is really working and it is but about few minutes later, the same fate goes the video has gone ...it was also blocked by the IOC. So, what's happening right now? Is it all about paid content? I think London 2012 Olympics coverage is just for money not for Olympics... there is news black-out happening. There are some broadcast that is exclusively for the UK citizens only and for the rich who can pay HD cable subscription. I have read that IOC wants it (London 2012) to be more social with this generation of digital age. With the promotion of online accounts, Twitter, Facebook and Youtube account... but that was all crap. It's not for everybody. You have to pay some penny first before you can access of what you want to see. Here's the excerpt from Yahoo News which shows the same feling of disappointment "Ensuring that these videos clips are available to share as soon as possible is in the IOC and NBC’s best interest. If people find the links, they’ll share them on their social networks, building even more buzz for the games and the myriad little human dramas played out within it. If NBC sits on its hands, or the IOC forces it to sit on its hands until hours or days after the viral moments, they pretty much ensure those moments won’t become viral and will have little or no impact on building Olympic-sized engagement. " With this, if the scenario will continue to happen for a month, London 2012 Olympics will be the worst World event then. There is a big disconnection. IOC should learn to share. The Queen got Twitter trend this day for the opening ceremony of London 2012 Summer Olympics as the most popular agent, James Bond in the name of Daniel Craig escorts Her Majesty from the Buckingham Palace to the Olympic Stadium. The Queen also announced that the Olympics is officially open. At the ceremony this day, Her Majesty spelled out the role played by her family after the Olympics were revived in Athens in 1896. “This will be the third London Olympiad. My great grandfather opened the 1908 Games at White City. My father opened the 1948 Games at Wembley Stadium. And, later this evening, I will take pleasure in declaring open the 2012 London Olympic Games at Stratford in the east of London,” she said. “Over recent months, many in these islands have watched with growing excitement the journey of the Olympic torch around the United Kingdom. As the torch has passed through villages and towns, it has drawn people together as families and communities. Unfortunately we are unable to publish the video due to some copyright issues. IOC is strict in the video publishing related to London 2012 Olympics. London 2012 Olympics have just began with the most awaited Grand opening ceremony, July 27, 2012 creates big excitation for those who have attended and to all spectators of the Summer Olympics that marks sports history worldwide. 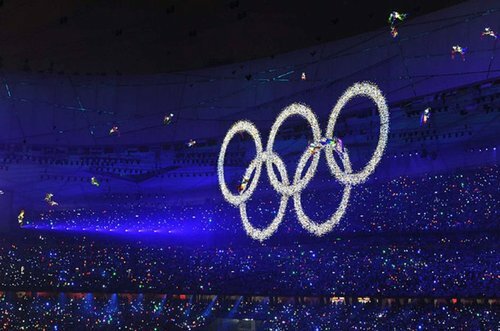 Opening ceremony marks amazing fireworks, dances and routines. 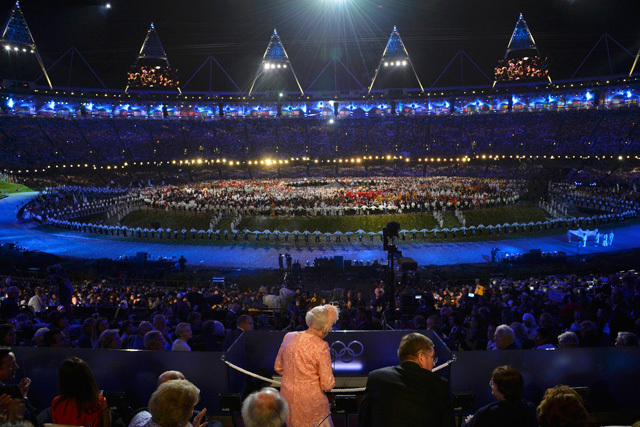 The London 2012 Olympics Opening is a memorable event with Danny Boyle, Oscar-winning director lead the ceremony. Stephen Daldry, filmmaker is also part of the tedious planning for the this glamorous event. Opening ceremony showcase London's diverse culture and musical heritage. The city of London has seen many sagas and both Boyle and Daldry are going to showcase it through movie effects and soundtracks. Ceremony also assert the financial prowess, prestige and competitiveness of a country. Some of the best features of opening ceremony are the parade of all representing athletes and arrival of Olympic Flame. It signals the beginning of the biggest month long sporting festival in the world. Target number of spectators is around 80 thousand in the stadium with 10 thousand athletes representing 205 nations. Based from the plan, Jacques Rogue the president of IOC will welcome the royal Highness Queen Elizabeth at the entrance of the stadium.Greece is the place where Olympics were first started, so to honor the country in the Olympic Games, Greek team is paraded first. The UK team would be the last team to enter the stadium. Learn more about London 2012 at their website http://www.london2012.com/ . They also provided a spectator Twitter channel to help you make the most of your London 2012 experience. Just follow. @L2012Spectators for the latest spectator information. In the recently released results for July 2012 Nutritionist-Dietitan Board Exam, Hannah Paulayn Yu Co of University of Santo Tomas (UST) grabbed the 1st place with 87 percent average rating. It was followed by Kimberly Palomo of University of the Philippines-Diliman with 85. 60%. The Professional Regulation Commission (PRC) announced on Friday night, July 27 that 601 out of 896 passed the Nutritionist-Dietitian Board Examination given by the Board of Nutrition and Dietetics in Manila and Zamboanga this July 2012. The results were released after two (2) working days from the last day of examination. The Professional Regulation Commission (PRC) announced that 35 out of 60 (58.33%) passed the Master Mariner Licensure Examination, 207 out of 423 (48.94%) passed the Chief Mate Licensure Examination and 950 out of 1,539 (61.73%) passed the Officer-In-Charge of a Navigational Watch Licensure Examination given by the Board for Marine Deck Officers in Manila and Cebu this July 2012. A total of 54 examinees are exempted from taking the practical examinations as they opted to submit a Certificate of Training and Certificate of Assessment in the Ship Simulator and Bridge Teamwork (SSBT). 1.Registration for the issuance of Certificate of Registration and Professional Identification Cards will start on July 30, 2012 but not later than August 10, 2012. The date and venue for the oathtaking ceremony of the new successful examinees in the said examination WILL BE ANNOUNCED LATER. 2.The deadline for submission of Certificates of Ship Simulator and Bridge Teamwork with Practical Assessment will be announced later. The Professional Regulation Commission (PRC) announced that 251 out of 352 passed the Optometrist Licensure Examination given by the Board of Optometry in Manila this July 2012. Meanwhile, (PRC) announced that 18 out of 19 examinees passed the Special Certification Examination in Ocular Pharmacology for Optometrists given by the Board of Optometry in Manila this July 2012. The members of the Board of Optometry are Dr. Vivian S. Sarabia, Chairman; Dr. Anita S. Villarta and Dr. Noel L. Santos, Members. The results for Optometrist Licensure Examination were released in three (3) working days whereas 10 days for Special Certification Examination in Ocular Pharmacology for Optometrists from the last day of examinations. Registration for the issuance of Professional Identification Card (ID) and Certificate of Registration will start on Monday, July 30, 2012 but not later than August 3, 2012. Those who will register are required to bring the following: duly accomplished Oath Form or Panunumpa ng Propesyonal, current Community Tax Certificate (cedula), 2 pieces passport size picture (colored with white background and complete nametag), 1 piece 1” x 1” picture (colored with white background and complete nametag), 2 sets of metered documentary stamps and 1 short brown envelope with name and profession and to pay the Initial Registration Fee of P600 and Annual Registration Fee of P450 for 2012-2015.